Many clients ask us why we have our Array headquarters based in Akron, Ohio – after all, it’s not exactly close to Madison Avenue. But after having lived and worked all over the world, there is no place I would rather be. Akron and its surrounding communities are simply a wonderful place to live and work. I was reminded of just how special this community is last week after participating in the I Promise campaign, a program that sends volunteers out into the Akron community to help local residents with landscape rehab – think Extreme Makeover: Landscape Edition. The effort lasted two days, included 10 homes and was sponsored by the LeBron James Family Foundation and supported by many community organizations and businesses, including our friends at Power Media – an Akron large format print house and fabricator. Jon Erisey, a friend and the founder of Power Media, asked if I could help him project-manage a fence installation at the home he and his team where asked to rehab. Knowing my construction limitations, he assured me there would be plenty of capable volunteers to assist at getting the job done and fix any and all of my mistakes (whew!). All kidding aside, the rehab project was more than rewarding, it was fun! What made the time fly by was a group of 30 working towards a singular goal: changing lives. Thanks LeBron, thanks Jon, and thanks Akron. 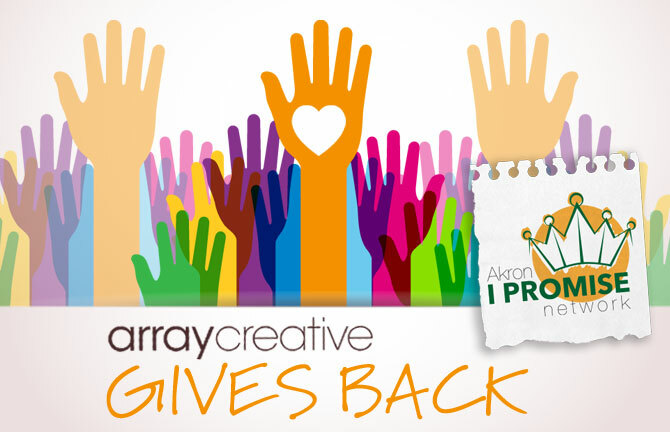 The one thing we at Array Creative understand is that giving back to our community is essential. Whether individually or as a team, it is part of our DNA. As long as there are organizations like the LeBron Family Foundation, the Autism Society, and Akron Children’s Hospital who need community support and active participation, we are motivated to help! With the same vigor and creativity that we put towards our client projects, we jump in headfirst supporting events like Akron Children’s Hospital’s Hope Lights the Way and Dancing for the Kids or the Autism Society’s Walk and Run. We BELIEVE the Akron community is the right place for Array Creative. We will open other offices and continue to spend way too much time in cars and planes, but Akron is our home. Akron’s first son said it best, “…I was a kid from Northeast Ohio. It’s where I walked. It’s where I ran. It’s where I cried. It’s where I bled. It holds a special place in my heart.” Thanks to Ian and Eric, my colleagues at Array, for supporting these efforts and to people like Jon Erisey who never think twice about giving back. The next time you raise a glass raise it to Akron, and if not Akron, to your own hometown.